The city of Salzburg is such an amazing place to visit any time of year as it is very compact, full of history, and everywhere you turn there is a different stunning viewpoint. Every time we come to Salzburg we new terrace or vantage point to admire the city from that we never knew was there before. This guide is meant to show you where the best viewpoints in Salzburg are, how you can reach them, and inspire you to find even more. Most of the best viewpoints in Salzburg are going to be either facing the mighty High Fortress dominating the skyline or looking down from it. Simple changing your angle as you circle the main sights in Salzburg can turn an intimate scene into a sweeping panorama after only a couple of steps. We hope that our guide to the best viewpoints and terraces in Salzburg helps motivate you to come see that the hills are alive with The Sound of Music. 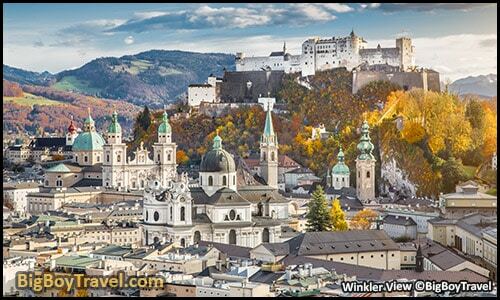 About Winkler Terrace: Sitting high above the Western side of Old Town Salzburg on the steep cliff of Monk’s Hill (Mönchsberg), the historic Winkler Terrace has one of the most breath-taking city views in Europe. With a sweeping vista over this magical town, its no wonder that panoramic Winkler Terrace was featured in some of the most iconic scenes from the hit 1965 movie The Sound of Music. You’ll see the sights of this former Roman settlement spread out before wedged between the Salzach River and the mighty High Salzburg Fortress. Named after a coffee shop that once stood nearby, Winkler Terrace is now home to the M32 Cafe (horrible service), the Modern Art Museum, a fairytale water tower, and it sits next to sections of the Medieval city wall. This Militia City Wall (Bürgerwehr Mönchsberg) was built on the hilltop from 1465-80 and is also listed below as another one of our favorite viewpoints in Salzburg. Getting Here: An elevator brings you straight up the sheer cliff to Winkler Terrace. Alternatively, you can also come up the steep backside of Mönchsberg Cliff near the brewery by foot (20-25 minutes), bike (15 minutes), or taxi (10 minutes). From the city center, you can also climb the steps near Toscaninihof Square and stroll along the hilltop. Featured On: Sound of Music Movie Tour. About Kapuzinerkloster: The tall Capuchin Hill on the Northside of the Salzach River has commanding views of Salzburg’s colorful waterfront and while you stand at eye-level to the High Fortress. Settlement on his tree-covered hillside predates the Roman settlement that once covered all of Old Town (Altstadt) by thousands of years back to the Neolithic Era. The top of the hill is the highest point in Salzburg and has a few other great viewpoints we will mention later in this guide. The main panoramic lookout is along the fortified terraces of the Capuchin Monastery (Kapuzinerkloster) located 1/4 of the way up the 2081 foot tall Capuchin Hill (Kapuzinerberg). The devote monks were invited to Salzburg in 1594 established their monastery inside the remains of the former Trumpeter Castle (Trompeterschlössel) which dates back to the 1200s (Fortified in 1405) to protect what was the town’s only bridge below. Today the scenic lookout best for both monks and tourists as one of the best viewpoints in Salzburg. In addition to the great views, and peaceful monks, you’ll love the decorative Gothic oak door at the monastery, which is a relic old Salzburg Cathedral after it was rebuilt in the early-1600s. Getting Here: You can climb the winding sloped road up the hill off Linzergasse by foot or bike. Alternatively, take the steep steps up from Steingasse near Shrimps Bar. Featured On: Free Salzburg Walking Tour. About The High Fortress Northside: Salzburg’s High Fortress is truly mighty as it gleams down over Old Town below it, providing the ever-present feeling of protection. This massive Medieval castle is one of the best preserved in Europe and was never taken by force. While the original fort through Roman time and the re-development in the 700s which gave Salzburg its name (meaning Salt Castle) sat where the Nonnberg Abbey is, the hilltop was finally developed in 1070. A sprawling castle complex with one of the best viewpoints in Salzburg quickly came together as a city within a city for the Prince-Archbishop retreat to when needed. There are two separate outdoor areas on the Northside of the Salzburg Castle to admire the city below. We loved that the huge panoramic deck on the Northside of the High Salzburg Fortress also has the wonderful City Terrace Beer Garden. After taking a tour of the castle, the City Terrace is an excellent place to rest your feet with some food or a cold beer under the shade of well-positioned trees. This is by far one of the best beer garden or restaurant views in Salzburg. About Bastion Trail: Sitting on the first tier of the Kapuziner Hill, the wooded Bastion Trail (Basteiweg) hugs the top of the cliffside along a preserved stretch of Medieval wall. The peaceful footpath is very popular with local hikers, but isn’t visited very often by normal tourists. The main highlight of the scenic trail is an amazing view from the lookout next to an old bastion guardhouse. This vantage point is where professional photographers go to get their money shots in all types of lighting with a unique angle on the High Salzburg Fortress towering over the town. Getting Here: From the Monastery it is a 0.35 miles hike to the guardhouse viewpoint but it feels shorter. It is also possible to follow the trail further to the Saint Francis Fortress at the top of the mountain if desired which is an additional 0.65 miles. About The Southern Terrace: While the natural flow of a visit to the High Salzburg Fortress (Festung Hohensalzburg) funnels tourists along the North side of the castle, the views on the Southern terrace are among the most rewarding in town. The lookout above the steep cliff on the South side of the castle opens over a 4-mile-long luscious plain framed dramatically by mountain peaks which are the start of the Alps. In addition to the main lookout deck, there is also a wonderful outdoor Panoramic Restaurant on the Southern terrace offering splendid mountain views. The highest and most iconic of these peaks that you’ll see from the High Fortress is Untersberg almost 6 miles away on the border with Germany. Untersberg is only 6,470 feet (1972 meters) tall which is pedestrian for the Alps, but it looks much larger with the valley 5,500 feet below as its foot. The Untersberg can be submitted by cable car and has a small ice cave fabled to hold the resting spirit of Charlemagne the Great, the 1st Holy Roman Emperor. By name, Untersberg Mountain was also a location in the Movie the Sound of Music as the place with Maria would frolic (filmed elsewhere) and fictionally where the Von Trapps hiked over the mountains to freedom. The real-life Von Trapps escaped by train to Italy, the other side of Untersberg Mountain actually held Hitler’s backup command center, and Switzerland is in reality 250 miles away over the Alps which would have been a tough hike. This breath-taking view of the Alps from the South side of High Salzburg Fortress will likely inspire you to visit the mountains close up which you can easily do as a day trip to Untersberg or, even better, a few miles further to Berchtesgaden. About The Mirabell Gardens: Laid out in 1730, (public since 1854) the playful Mirabell Palace Gardens are one of our areas of Salzburg. The name Mirabell literally means beautiful view, so you know you’re in for a treat offering some of the best views of Old Town. Filled with elegant statues, packed with flowers, plus a hidden dwarf park, the Mirabell Gardens are most famous for the scenes of the 1965 movie The Sound of Music that were filmed here. During the song Do Re Mi, Maria and the children skip around the gardens while singing before it comes to a climactic end at the steps at the rear of the park. These steps are not only famous from the movie but also as one of the best views in Salzburg stretching across the Mirabell Gardens all the way to the High Fortress. The Mirabell Palace neighboring the steps is also of note as it was laid out in 1606 by the Prince-Archbishop for his mistress Salome and later was where Mozart performed concerts as a boy. About Leopold Palace: Out of any of the locations used in the filming of the movie The Sound of Music, the wonderful lake terrace at Leopold Palace was the most used. Once you step foot on this magical patio, you’ll see why the directors chose the mansion to represent the Von Trapp Manor in all of the lakeside scenes. The highlight is the boat gate with two beautiful mermaid-tailed pegasus horse statutes framing up the fabled Untersberg Mountain in the distance. The patio was also the home of the romantic gazebo during the filming although most of those scenes were shot in Hollywood. The only reason by the Leopold Palace terrace isn’t higher on our list of best viewpoints in Salzburg is that you have to be a hotel guest to access the patio. Non-guests and tour groups are restricted to viewing the terrace from a vantage point on the opposite shore of the man-made lake. This view of the stately mansion reflecting in the water is equally as stunning, but having seen it from both sides, you may want to look into staying overnight in their hotel for the more famous angle. About Judge’s Height: Named after surveyor and alpinist Eduard Richter in 1906, the Judge’s Height Lookout (Richterhöhe) is a true hidden gem of Salzburg. You’ll get spectacular views of the Alps over a 4-mile-long grassy plain like you do from the South side of the High Fortress, but here there are no tourists. You can pick your feet up on a scenic park bench while peering over the edge of the Medieval wall in total relaxation. The views of the Salzburg castle are also great and we love to frame it up between the battlements of the wall. Sharing the lookout point with you are the important Joseph’s Tower (Josefsturm) and Micheal’s Tower (Michaelsturm) built to protect the South side of town in the 1300s. Below the side of the wall is a picturesque vineyard and remains of a third Medieval tower called Bertholdsturm. The vineyard was actually started by the local Boy Scout Troop in 2008 and the same slope where grapes were originally grown in the Middle Ages. Near the Judge’s Height Lookout, the castle-like Constantine Tower Mansion (Mönchsberg 17) which was the Medieval falconer’s house and later once home to the famous playwright Peter Handke. Another cool mansion nearby is the Red Tower (Mönchsberg 15) which built in the 1300s was city defenses and has been a private home since 1862. On your way to the Red Tower, you will pass a small Buddhist Stupa Shrine, a snack stand (open Noon-9pm; Winter until 7pm), and catch addition views of the castle while you stroll up the Doctor Ludwig Prahauser Path. About The StieglKeller: Just 1/4 the way up the cliff toward the Salzburg High Fortress is the historic StieglKeller Beer Garden with splendid city views. While they have an indoor hunting lodge-themed restaurant area, the best views of Salzburg are from the partially shaded by trees, the multi-level beer garden with room for over 1000 guests. Almost every outdoor table has a great view of Old Town, but from a unique height just above the tops of the numerous bell towers of Salzburg. Especially with the way the light catches on the side of the Dom Cathedral, the StieglKelly Beer Garden is the best place to watch the sunset in Salzburg. Stiegl (meaning Little Step) Beer has long been a pride of Salzburg as they started brewing in town in 1492 and are the largest brewery in Austria that is still privately owned. While some delicious Augustiner beer is also brewed in Salzburg, it originates from Munich and Stiegl is the real local drink. The authentic Austrian food at the beer garden while you take in one of the top ten views in Salzburg is also an added bonus. About Kapitelplatz: The vast Chapter Square (Kapitelplatz), known for its festival events and outdoor movies, is one of the only places to get gorgeous unobstructed views directly below Salzburg castle. Adding extra flair to any photos you take in the square are an over-sized chess board with two-foot-tall pieces and a 30-foot-tall yellow orb sculpture topped with a standing man. Officially called Sphaera, the art piece was made as part of a series across Europe in 2007 by artist Stephan Balkenhol and is locally called Mann auf Mozartkugel. Mozartkugel are famous round local treats created in 1890 out of chocolate and named after the city’s favorite son Mozart. The name of the square comes from the local chapter high clergy from the neighboring Salzburg Cathedral that housed in the square through Medieval times. Disbanded in 1803, the remainder of the square of opened up to provide wide-angle views of the castle above, but they kept the ancient horse bath intact. Flanked by two trees, the horse bath fountain served as a Medieval car wash for horses. The Chapter Square is also featured in the hit 1965 film The Sound of Music as the place where Maria catches the bus from Salzburg to visit the Von Trapp Family for the first time while singing “I Have Confidence”. About The Bell Tower: The only reason this stunning viewpoint in Salzburg isn’t in our top 10 is because it is closed in the Winter, but it is amazing. We recently climbed the New Residenz Bell Tower as part of their weekly tours on Tuesday evenings and the perspective it gives you over the main square and toward the castle was are very unique. You also get to learn a lot about the construction of the building on your journey up. The highlight may be seeing the guts of the glockenspiel up close as the bell system goes off in an enchanting musical number. About Chapter Square: The views as you walk through Chapter Square are more of an inverted perspective as you are below all of the sights instead of above. The sweeping vistas of the High Fortress as you exit Cathedral Square (Dompaltz) toward Salzburg’s famous 30-foot-tall yellow orb sculpture called the Sphaera are breath-taking. About Hotel Stein: The renowned Hotel Stein sits on the location of a Medieval brewery and an important watchtower that once protected the entrance into Salzburg. Today visitors come for their top-notch accommodations and the panoramic views of Salzburg from their rooftop terrace. Often when we visit here in the evenings we have had our choice of seating on the terrace even though it is very popular. The best time to visit is often in the morning for brunch where you can have a drink and delicious food while watching the sunlight slowly cast Salzburg’s shadows away. About Cathedral Quarter Terrace: This overlooked terrace once gave the Prince-Archbishop of Salzburg uninterrupted access between the Cathedral and his private residence, but now gives tourist epic views over the main square. The views here aren’t as dramatic as from the bell tower, however, there is something cool above seeing the square from above, but in closer detail. One of the best things about the hidden terrace is that it is open almost every day of the year and is included for free when you buy tickets for the Residenz Museum and Dom Museum. About The Love Lock Bridge: Known as the Love Lock Bridge, the Makart Footbridge (Makartsteg) is lined with tourists leaving paddle locks in hope for good luck. The bridge was named after 19th-Century painter Hans Makart who was known for his epic scenes, but tourists often get too caught up with the locks to notice the scenery. You’ll get great views of the tour boats leaving to cruise the Salzach River and a unique wide angle of the colorful Medieval homes along the waterfront. About Mönchsberg Palace: While the castle-like Mönchsberg Palace is little tucked back to get direct views of Old Town Salzburg, the winding approach to the hotel has some unmatched scenic lookouts. The property was first documented 1350AD as the Tetelheimer Tower (Tetelheimer Turm) and then became a treat for the professors of Saint Peter’s Monastery in 1654. The retreat was turned into a luxury hotel in 1948 and has become one of the best places to stay in town. Directly from the castle, there are some pretty good wooded views of the countryside from the large infinity pool as well as their Glass Garden Restaurant and Apollo Bar. Featured On: Best Places To Stay In Salzburg. About The Müllner Footbridge: Sitting just on the edge of Old Town Salzburg, the Müllner Footbridge gives you excellent views of town in a largely tourist-free environment. We love riding our bike over to the bridge where you can relax and watch the water flow like a liquid road from the High Fortress. About The Salzach Riverbank: The grassy shorelines along the Salzach River let you have similar views to the ones you get on Müllner Footbridge, but with the ability to lay out and get some sun while you relax. There aren’t many green spaces in the heart of Old Town, so resting on the riverbank can be a very rewarding experience with views to match. About The Saint Peter’s Cemetery: This Medieval cemetery has been in use since at least the 700s offers a number of unique viewpoints in a small area. We love the combination of being down low to see the castle above us while surrounded by beautiful flower-filled graves. Equally impressive are the views from the crypt carved high inside the cliffside looking back down over the cemetery. About The State Bridge: Cutting into the heart of Old Town, the State Bridge gives you the same view of Salzburg that visitors have been getting since 15AD. Salzburg had started as a Roman settlement of Juvavum (15BC-488AD) and the original Roman Bridge (römische brücke) was the only one to span the river until the State Bridge was erected in 1599. If you are visiting Salzburg for more than a day, you may get overly used to the vistas from the State Bridge, so you have to remember to admire the view. The lighting and vibe from the bridge are especially magical around sunrise. About The Salzburg City Park: Just behind the Southside of the High Fortress is the grassy Salzburg City Park which spreads out uninterrupted for what seems like a mile as you walk it. The views from the park looking back at the castle are very peacefully and it is one of the best places in town to ride a bike. If you do rent a bicycle you need to ride just beyond the edge of the park to see the stunning facade of the Hotel Schloss Leopoldskron reflecting off its man-made lake with the High Fortress in the background. After seeing the lakefront, it is no wonder that they used is for many of the most iconic scenes in the famous movie The Sound of Music. About Monastery Hill: The top of Monastery Hill has lightly settled since Neolithic times around 1000BC, long before the Romans got here in 15AD. At the very top, along the back side of the hill is the Franciscan Palace (Franziskischlössl) which was built as a watchtower for the city’s Medieval wall defenses in the 1600s. From the palace, now a restaurant, you can get views toward the North where Salzburg would be on the lookout for Germanic invaders and even attacks from Bavaria. About Untersberg Mountain: Just a few miles South of Salzburg is the closest opportunity to get up close and personal with the Alps. The most iconic peak in this stretch of mountains is Untersberg which has a handy cable car that takes you to the summit. We love to go a little further into the mountains to spend time in nearby Berchtesgaden but the views from Untersberg are very good. The folklore alone is enough to draw people to the summit as it is said that the spirit of Holy Roman Emperor Charlemagne the Great lies in the small ice cave here waiting for the Empire to rise again. About Gaisberg Hill: If you ask many locals where the best hiking close to Salzburg is they will tell you to head up to Gaisberg Hill & Nockstein Peak. Having hike to the top during peak autumn colors, we can say that it can be unreal to visit Gaisberg Hill. Other hiking in Berchtesgaden and the Salzkammergut district is even better, but with Gaisberg Hill sitting a short distance from town it is a longer hike you can do right from your hotel room. About Maria Plain: We almost feel guilty sharing the secret spot of Maria Plain with you as it is that good, but no best viewpoints in Salzburg list would be complete without it. While it will take you 30 minutes (bus plus hike) to get here from the heart of town, the rewarding views let you see all of Salzburg laid out with a backdrop of Alpine peaks.